Naturally Bespoke Cakes > Blog > Promotion > Website changes…and Stocktake Sale! Gosh, where is this year going? I can’t believe it’s almost Easter and the end of the financial year already. I’ve just been having a little overhaul of our website to improve usability on mobile devices and also adding in a few extra features. One of the main extra features is having PayPal in our checkout. This now means that you can pay by credit card or use a PayPal account if you have one. You are still able to pay by direct bank transfer or cash if you wish to collect. While we have done our best to test that everything is working correctly, if you do experience any issues please contact us with the details so we can fix it. 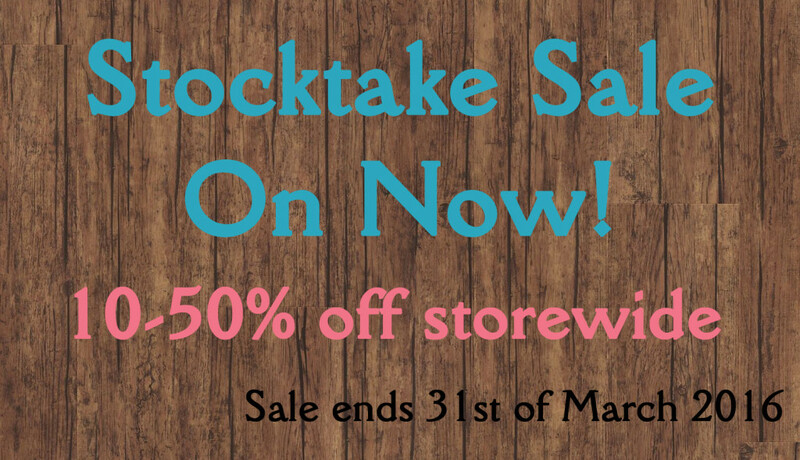 To celebrate the end of year (and to make my stock count quicker) we are having a Stocktake Sale. Every product store wide is discounted by up to 50%. Better get in quick as these great prices are only until the 31st of March or while stocks last!